Being over 3,000 years old, the Irish language (Gaelic / Gaeilge) boasts the oldest living literature in Western Europe. It is studied by universities in 17 countries. Gaelic is a Celtic language. The Celtic languages are now confined largely to Scotland, Isle of Man, Wales, Brittany and Ireland. Each year these countries celebrate their common heritage in the Pan Celtic Festival. All these Celtic countries have their own variation of Gaelic. In the 4th century when Gaelic appeared for the first time in written form on Ogham stones. By the 6th century the language began to appear in parchment it was distinctly ´Irish Gaelic´. From this time onwards the language drifted away from the Gaelic of its Celtic neighbours. Even within Ireland regional dialects emerged and grew stronger. Three main variations came to the surface, Munster Irish, Connacht Irish and Ulster Irish. Leinster seems to have been a melting pot for all three dialects. The original form of the language seems to have survived only in the Connacht area. The Munster Irish was influenced by the Anglo-French of the Normans who came here in the 12th century. In Ulster the language was affected to a considerable degree by the large number of Scots brought in during the plantation of Ulster in the 17th century. The English language, along with Anglo-French, arrived in Ireland with the Normans. It was not until the enforcing of English rule by the tyranny of the Cromwellian wars that the English language began to get a foot-hold in the country. As late as 1613 there were members of parliament who did not speak English. In 1628 we have a reference to a group of Irish nobles and gentry asking for the appointment of at least one Irish-speaking judge as ‘many of the subjects hazarding their causes and sometimes their lives because they are not understood by the judges without interpreters’. Irish now became more the language of the people and their Roman Catholic religion. English was seen as the language of the oppressor and the Protestant Reformation Church. However, the nobility and gentry were drawn ever more into the use of English, being the language of the government and commerce. By 1642, at the Conference of Kilkenny, all the business was conducted in the English language – seemingly without any complaints. The National School scheme was set up in 1831. The new education system strongly discouraged the use of Irish and the number of native speakers was to fall rapidly from over 1,000,0000 at that time to the isolated pockets of today´s Irish speaking Gaeltacht areas. For the hundreds of thousands that were to emigrate after the Great Famine of 1846-´48, English became necessary to survive in the streets of such cities as Boston and New York. This devastation of the language even affected places as remote as the Great Blasket Island off the Kerry coast. In the 1911 census of the Island only one person signed their name in Irish, Tomas O Criomhthain, author of An tOileanach. As you travel around Ireland on your vacation you will notice that the Irish language is quite visible. 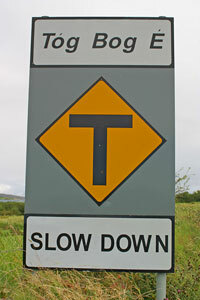 New road signs, names of shops and pubs are very often written in Irish. The number of all-Irish language schools and pupils has grown beyond all expectations. Five years ago Killarney´s Gael Scoil (all Irish School) had one teacher and seven pupils. Today it has seven teachers and 164 pupils. A most significant boost to the language has been the all-Irish radio station, Radio na Gaeltachta and the Irish language telivision station, TG4. Why not do your bit to help preserve this beautiful language. When you are leaving a shop or the pub, why not use the Gaelic word “Slan” (pronounced ‘Slawn’). It would be a boost to the language and is sure to bring a warm smile.